You can’t miss an Aiphone emergency tower. But that’s the idea. With their bright blue lights, colorfully painted modules and a tall CCTV camera arm, they serve as a beacon of safety on a college, university, hospital, or corporate campus. Our towers are always on, waiting to immediately connect people who need help with campus police or security. You’ll see them along walking paths, in parking lots, and garages, around dorms, and in recreation centers. Smaller, wall-mounted Aiphone emergency stations are in stairwells and elevators. Both the towers and stations are an important layer of outdoor security. When first responders receive a call, officers immediately know the tower’s precise location. 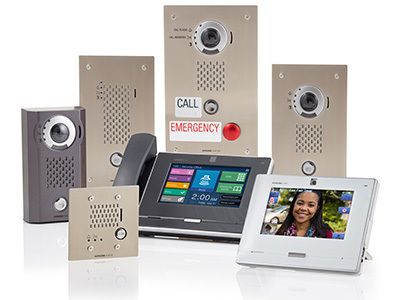 Our built-in video intercoms help officers quickly assess a situation and respond accordingly. Security personnel can get more information by using our optional CCTV camera arm. Even people needing directions to a building or office can call in for assistance. We’ve also made our emergency towers easier and less expensive to install. Our rugged steel-bodied modules weigh around 90 pounds. There’s no need to rent a crane to lift them into place – two people can typically handle the job. Recent enhancements include built-in mounting hardware, rear access panels to easily pull wire from top to bottom, and UL Listed electrical boxes to easily satisfy local electrical codes. And you’ll always get the right tower height with our two- or three-module design. Effective. Easy to install. Flexible. Just three reasons why campuses across North America choose Aiphone emergency towers. Learn more about Aiphone Emergency Solutions.